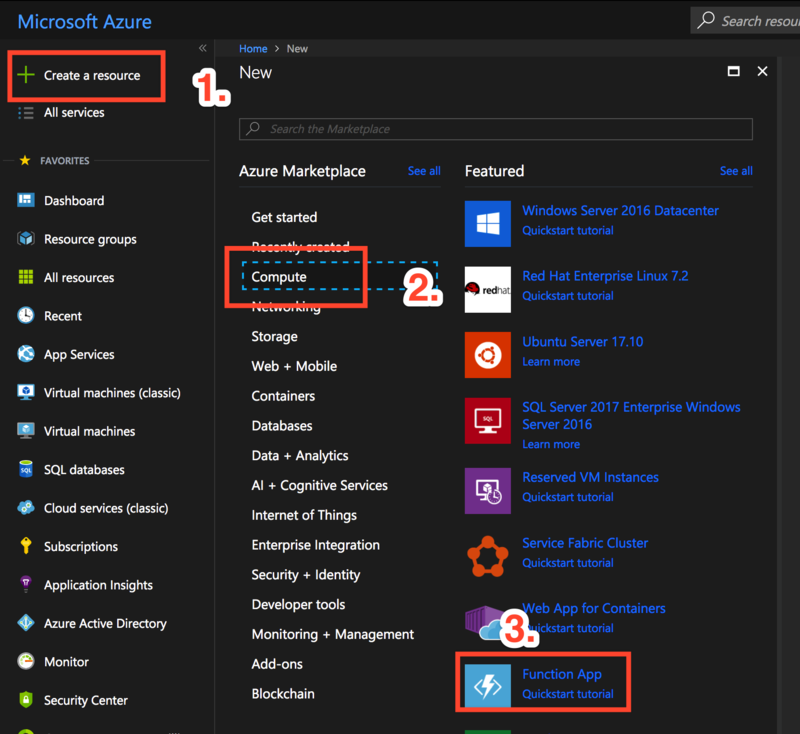 This article describes on how to build an Azure HTTP Function which will be triggered by the Geofency App which is available on the App Store. For this tutorial I need to provide some background information. 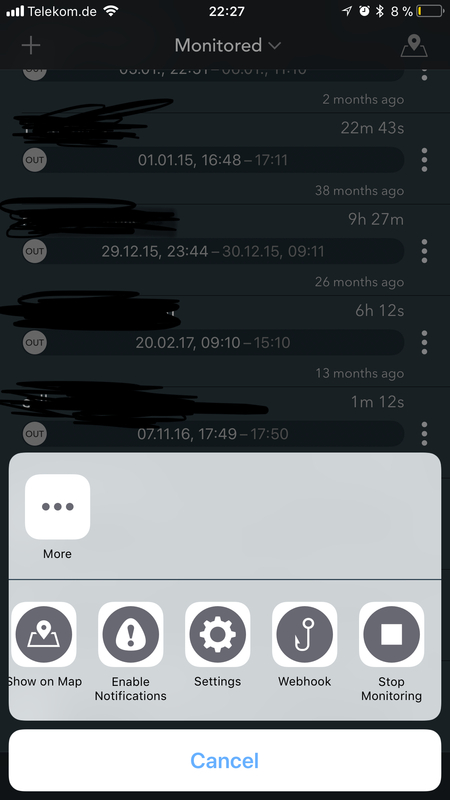 In our startup we’re using Toggl for time tracking. Privately I’m using the App Geofency for tracking location times for spot I’m visiting often. So now I had the problem that I often forgot to stop my Toggl timer after a day of work. The good thing about that is, that Toggl provides an REST API and Geofency supports web hook triggers. You need to check if there is currently a timer running. If so, the API will return the time entry in the results. So that’s the point where Azure Function get into it. 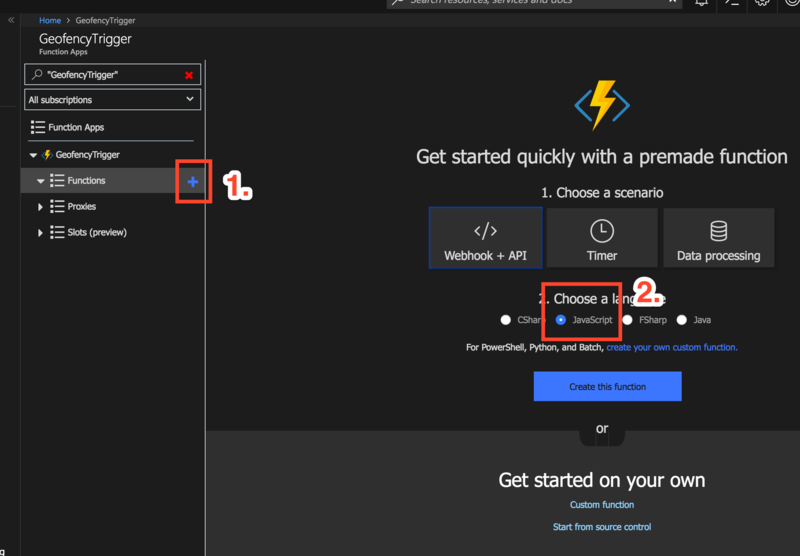 Before you could start developing the Azure Function you need to create it on the Azure Portal. If you don’t have an Azure Account, you can create one here: Microsoft Azure. Now you need to define an app name. Let’s call it GeofencyTrigger for example. Select your subscription, create a new resource group (GeofencyTriggerGroup), maybe change the server location under Location to a place which is nearer to you. The deployment process could take a while. At the last step for programming preparations we want to create the HTTP trigger for our app. So click on Functions and on the blue plus symbol for adding a new function. That’s it for the setup. You now have successfully created a Hello World NodeJS Azure Function. Next step is about implemented the function itself. First of all we need to create project folder. Let’s call it GeofencyFunctions. In this folder we’re going to run npm init for create a package.json file. No we’re adding the index.js file which will contains our function. This file should export our default function which will be triggered by Azure Functions. Hint: In this function.json you could also configure which exported function the Azure Function trigger should call if you have more than one exported function in you index.js. Now we need to write the function which get’s the current time entry on Toggl. So now that we got the time entry, we may need to check if it has data. The Toggl API will return null if no timer was running. If there is no data specified we could quit the function and return a success call because we don’t need to stop anything. We now have forgot an important thing. Toggl has multiple options to authenticate through their API. One simple method is using Basic Authentication. Fo simplicity I’ll pass the username and password through parameters to the Azure Function later. So we need to get these parameters and pass them to the Toggl API. The simplest approach is to add them to the request package request. Now the next step will be stopping the timer. In the previous step we checked if the time entry has valid data. 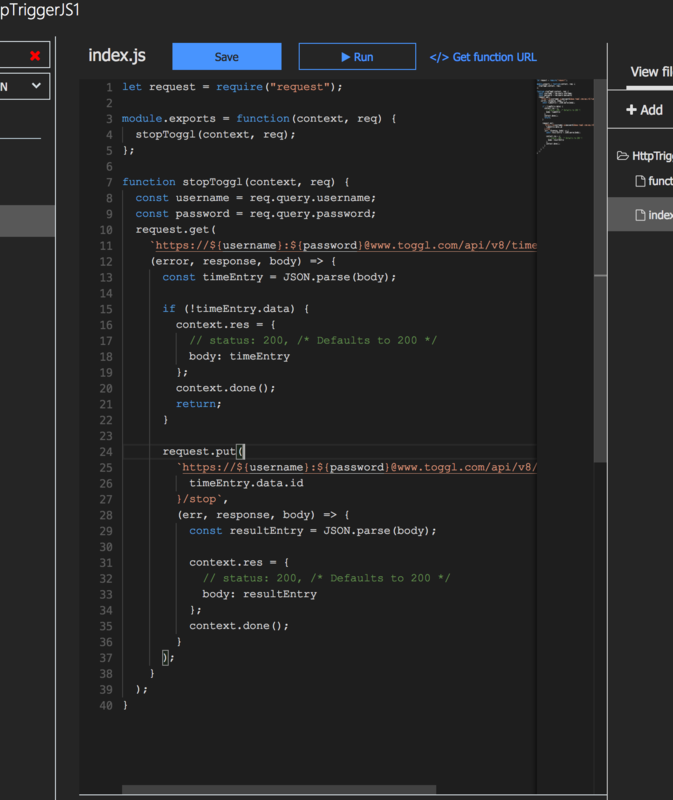 Now we need to handle these data and pass the id of the entry to another API request to Toggl. Also click on the plus to add a new file called package.json. Copy your package.json content here and hit save. There is now one step left. As you may remember we’re installed the request package before using npm. This package is now obviously missing on Azure Functions. So the scm portal is: https://geofencytrigger.scm.azurewebsites.net. After this is finished, you should see a node_modules folder in your Function directory. Now you’re all set!